We analyze the price responsiveness of U.S. conventional and unconventional oil supply across three key stages of oil production: drilling, completion, and production. Drilling is the most important margin, with price elasticities of 1.3 and 1.6 for conventional and unconventional drilling respectively. Well productivity declines as prices rise, implying smaller net supply elasticities of about 1.1 and 1.2. Despite similar supply elasticities, the price response of unconventional supply is larger in terms of barrels because of much higher production per well (~10x initially). Oil supply simulations show a 13-fold larger supply response due to the shale revolution. The simulations suggest that a price rise from $50 to $80 per barrel induces incremental U.S. production of 0.6MM barrels per day in 6 months, 1.4MM in 1 year, 2.4MM in 2 years, and 4.2MM in 5 years. Nonetheless, the response takes much longer than the 30 to 90 days than typically associated with the role of "swing producer." This paper addresses the implications of the emergence of distributed energy resources (DERs) for competition in the electricity distribution systems. The regulations on industry structures in place today were designed in an era characterized by centralized resources and relatively price inelastic demand. In light of the decentralization of the power sector, regulators and policy makers must carefully reconsider how industry structure at the distribution level affects competition, market development, and cost efficiency. We analyze the economic characteristics of distribution network owners and operators, DER owners, and aggregators and retailers. We translate the foundational theories in industrial organization and the lessons learned during the previous wave of power system restructuring to the modern context to provide insight into three questions. First, should distribution system operations be separated from distribution network ownership in order to ensure the neutrality of the DSO role? Second, should DNOs be allowed to own and operate DERs, or should DER ownership be left exclusively to competitive actors? Third, does the emergence of DERs necessitate a reconsideration of the role of competition in the provision of aggregation services such as retailing? This paper is the first part of a two-part series on competition and coordination in rapidly evolving electricity distribution systems. This paper addresses the mechanisms needed to coordinate vertically and horizontally disaggregated actors in electricity distribution systems. The mechanisms designed to coordinate planning, investments, and operations in the electric power sector were designed with minimal participation from either the demand side of the market or distributed energy resources (DERs) connected at distribution voltages. The emergence of DERs is now animating consumers and massively expanding the number of potential investors and participants in the provision of electricity services. We highlight how price signals - the primary mechanism for coordinating investments and operations at the transmission level - do not adequately coordinate investments in and operations of DERs with network infrastructure. We discuss the role of the distribution system operator in creating cost-reflective prices, and argue that the price signals governing transactions at the distribution level must increasingly internalize the cost of network externalities, revealing the marginal cost or benefit of an actor's decisions. Price signals considered include contractual relationships, organized procurement processes, market signals, and regulated retail tariffs. This paper is the second part of a two-part series on competition and coordination in rapidly evolving electricity distribution systems. Energy Consumption in the French Residential Sector: How Much do Individual Preferences Matter? The aim of this research is to understand the impact of preference heterogeneity in explaining energy consumption in French homes. Using a discrete-continuous model and the conditional mixed-process estimator (CMP) enable us to address two potential endogeneities in residential energy consumption: energy prices and the choice of home energy characteristics. As a key contribution, we provide evidence that a preference for comfort over saving energy does have significant direct and indirect impacts on energy consumption (through the choice of dwelling), particularly for high-income households. Preferring comfort over economy or one additional degree of heating implies an average energy overconsumption of 10% and 7.8% respectively, up to 18% for high-income households. Our results strengthen the belief that household heterogeneity is an important factor in explaining energy consumption and could have meaningful implications for the design of public policy tools aimed at reducing energy consumption in the residential sector. To what extent are futures prices interconnected across the maturity curve? Where in the term structure do price shocks originate, and which maturities do they reach? We propose a new approach, based on information theory, to study these cross-maturity linkages and the extent to which connectedness is impacted by market events. We introduce the concepts of backward and forward information flows, and propose a novel type of directed graph, to investigate the propagation of price shocks across the WTI term structure. Using daily data, we show that the mutual information shared by contracts with different maturities increases substantially starting in 2004, falls back sharply in 2011-2014, and recovers thereafter. Our findings point to a puzzling re-segmentation by maturity of the WTI market in 2012-2014. We document that, on average, short-dated futures emit more information than do backdated contracts. Importantly, however, we also show that significant amounts of information flow backwards along the maturity curve - almost always from intermediate maturities, but at times even from far-dated contracts. These backward flows are especially strong and far-reaching amid the 2007-2008 oil price boom/bust. Decomposing Crude Price Differentials: Domestic Shipping Constraints or the Crude Oil Export Ban? Mark Agerton and Gregory B. Upton Jr.
Over the past decade the primary U.S. crude benchmark, WTI, diverged considerably from its foreign counterpart, Brent, sometimes selling at a steep discount. Some studies pointed to the ban on exporting U.S. crude oil production as the main culprit for this divergence. We find that scarce domestic pipeline capacity explains half to three quarters of the deviation of mid-continent crude oil prices from their long-run relationship with Brent crude. We are unable to find evidence that mismatch between domestic refining configurations and domestic crude characteristics contributed significantly to this deviation. This implies that the short-run deleterious effects of the export ban may have been exaggerated. We investigate the extent and evolution of the links between energy markets using a broad data set consisting of a total of 17 series of prices for commodities such as electricity, natural gas, coal, oil and carbon. The results shed light on a number of relevant issues such as the volatility spillover effect in energy markets (within and across sectors) and the identification of those markets that are exporters (importers) of volatility to (from) other markets, as well as evidence of the time-varying nature of these effects. 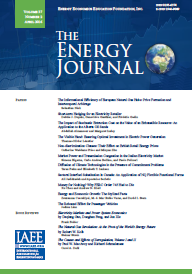 The main conclusions are: (i) the most integrated European electricity markets appear to be those of Germany, France and the Netherlands; (ii) the Dutch Title Transfer Facility might be on the way to becoming the benchmark price for natural gas in Europe, and (iii) natural gas may be replacing crude oil as the global benchmark price for energy commodities. This study explores potential implications of Arctic oil and gas exploration for public finance, with the Norwegian Lofoten region as a valuation case. A model is calibrated to turn oil and gas resource estimates into projections for investment, production, and net cash flows, which are discounted to assess the direct impact for the government budget. With the Norwegian oil fund mechanism and fiscal policy rule, Lofoten oil and gas revenues could add fiscal capacity in the range of 0.1-2.4 per cent of the current government budget, implying a permanent increase in annual government spending (or tax relief) of 24-220 USD per capita. Corresponding implications for other resource-rich countries in the Arctic depend on their resource potential and the relative role of oil and gas in their economy. This paper studies wholesale electricity markets where an exogenous price cap is enforced, compromising both short- and long-term incentives. To guarantee capacity adequacy, policy-makers may provide support for generation through a capacity remuneration mechanism (CRM) and/or encourage demand response (DR). Such mechanisms are formalised within a common simple analytical framework, clarifying how these mechanisms relate to each other. We then divide them into two categories, depending on whether their implementation requires transactions to be made based explicitly on spot prices higher than the price cap. While mechanisms that keep implicit these high marginal costs are likely to be preferred from a political perspective, they also appear to be less efficient. If they are to be implemented nonetheless, we suggest that the price cap should be set higher than the marginal cost of the most expensive plant, and highlight that challenges for demand-response integration in CRMs remain. This paper estimates consumer savings, CO2 emissions reductions, and price effects from increasing demand response (DR) dispatch in the Midcontinent Independent System Operator (MISO) electricity market. To quantify market effects, we develop a dynamic supply and demand model to explore a range of DR deployment scenarios. The study is motivated by the existence of regulatory and market rule barriers to market-based deployment of DR resources in the MISO region. We show annual consumer savings from increased market-based DR can vary from $1.3 million to $17.6 million under typical peak operating conditions, depending on the amount of DR resources available for market dispatch and the frequency of deployment. Consumer savings and other market effects increase exponentially during atypical periods with tight supply and high prices. Additionally, we find that DR deployment often reduces CO2 emissions, but the magnitude of emissions reductions varies depending on the emissions content of marginal generation at the time and location of deployment. The results of this study suggest regulators and other stakeholders should focus policy efforts to reducing regulatory barriers to DR deployment in wholesale markets, particularly in locations that experience high price spikes, to improve market efficiency and achieve cost savings for consumers.